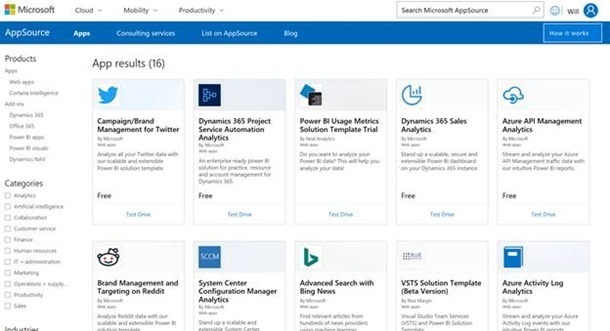 You might have read in our previous blog post that Microsoft wa invited to take part in the Gartner Data and Analytics summit’s “Bakeoff” competition. We wanted to give you all a feel for the demo we presented at the bakeoff and describe some of the steps we went through in preparing the data and report for it. You can interact with the report and download the .pbix file from the Data Stories Gallery here! Now, onto some of the steps for building the report. Gartner provided the data we were to use for the demo. It came from a variety of sources (CDC, Medicare and Medicaid programs, and Census bureau) and in a variety of formats (CSV, Excel, etc.). Understanding, cleaning and prepping the data model was, as is so often the case in BI projects, the bulk of the work! You’ll also notice that not every state reports the detail of which drugs were involved. This meant that in some visuals we could only show the overall values across all states, or pick certain drug types only for some states. The drug overdoses information was also, unusually, reported for a 12-month rolling period. To help report on this we created a ‘LastDayOfMonth’ column based on the year and month columns. 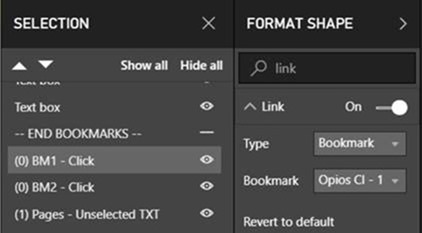 This made it easy to baseline everything at a low grain and use the built-in date hierarchies and time intelligence functions that Power BI provides. 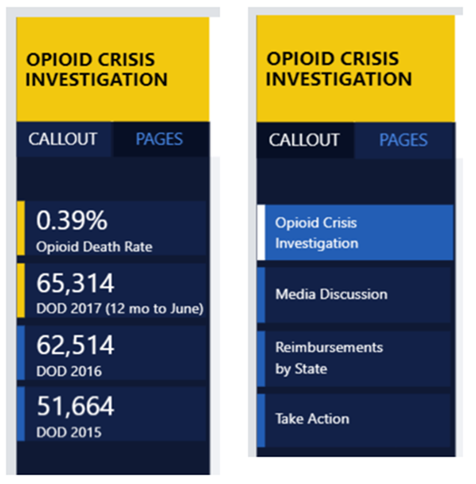 This sums the Drug Overdose Deaths column filtered to just the last date for whichever period is being viewed in the visual. The SUM() is required because it operates on the [Drug Overdose Deaths] column but should always only include one date anyway. One of the advantages of this DAX formula is that it returns only the last value from the date hierarchy but allows aggregation over other attributes, e.g. State. The DOD value is correct even when drilling down through the date hierarchy, but the total row is calculated correctly at the bottom of the table, and other aggregations such as Region still work correctly. The ISFILTERED function here ensures that the measure is being filtered by the date hierarchy, creates a variable (__PREV_YEAR) for the drug overdose deaths a year before the current value, and divides the difference by the previous value to give percentage change. It’s a common pattern and a good example of using DAX’s VAR feature, which allows variables to be defined and reused across a calculation to aid readability. This left some rows with blanks for the population estimate, which we managed through the reporting layer. We built several de-normalized tables to help with joining data from the various healthcare sources and the Bing News and Twitter data. This helped eliminate some unmatched rows such as the “YC” and “US” values in the Overdose table that correspond to New York City and the overall US, meaning we wouldn’t be double counting in any totals. In the Labelers table, we also removed the variants of “Inc.”, “LLC” etc. to ease readability in the report. This let us use the semantic model by creating relationships across the tables rather than having to merge the queries together. We also added some ‘helper’ tables that we used in slicers and demographic data for the Census and state representatives. With more time we had wanted to further de-normalize some of the facts out into other tables and set up relationships on more fields into the Bing and Twitter data. There were still several ‘dirty’ elements in the data such as products that only seemed valid for certain time periods, and labelers that seemed to have changed name at some point in time. We'd have needed more time to fully understand the structure of the data for these to really know how best to model it. 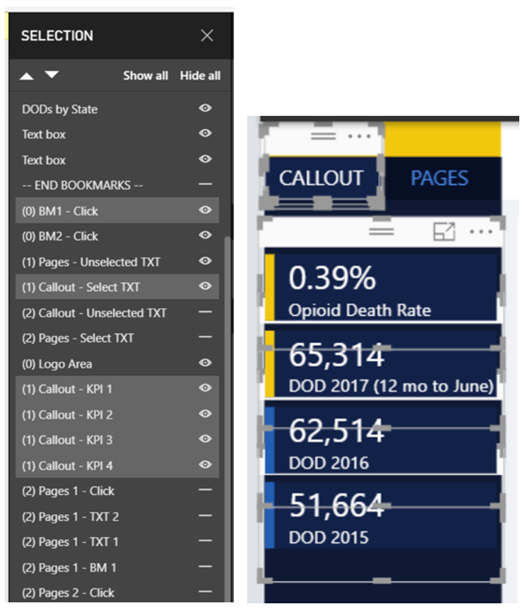 The bottom right hand visuals already show some of the drug names and news articles we wanted to match up with the structured data. These were the only visuals we needed for the final bakeoff report. And then paste them into the Query Editor in the other file. This copies all the dependent queries (which includes parameters for the database and server name). We had to then create a mapping table and relationships to the other data and add the right visuals to the report. 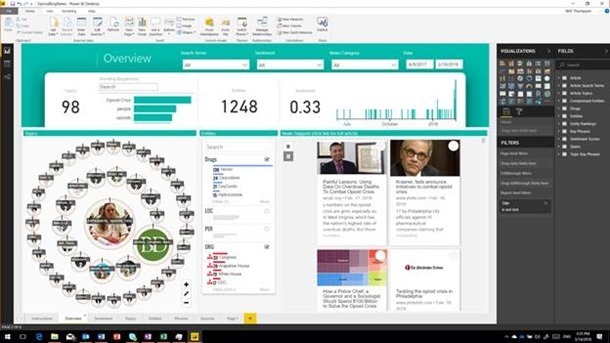 With more time we would have used more of the Sentiment Scoring capabilities in other parts of the report and fed more of the specific drug manufacturer and prescriber names into the Bing News template to pull articles that referred to them. 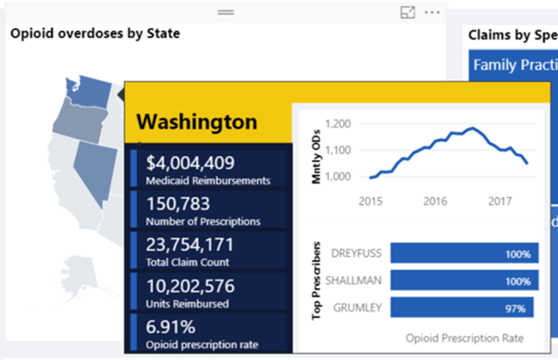 Beautiful layout and styling of a report is important to consider and easy to achieve in Power BI. Once we’d settled on a color scheme and rough layout for the report pages, we used 2 key features to apply them: themes and shapes. 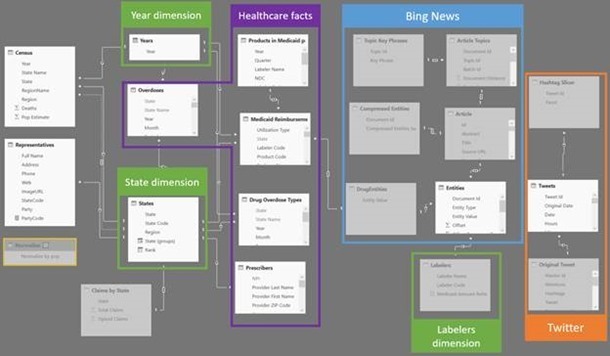 Themes are defined using a JSON file, but there are a few tools from the Power BI Community that make it much easier to create them. 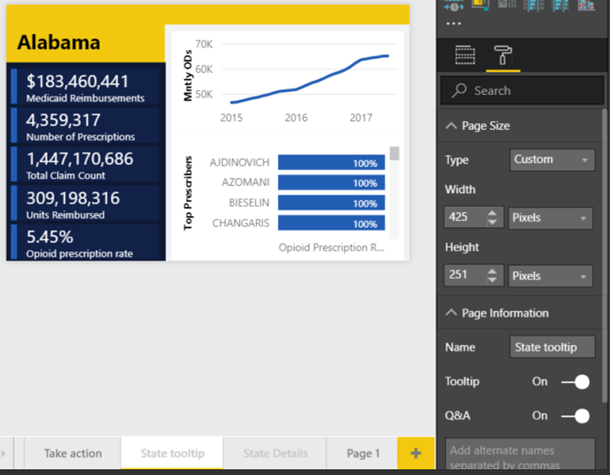 For example, https://powerbi.tips/tools/report-theme-generator-v3/. So you can download it and reuse or edit it if you like it! We were fortunate with the timing of our March release to include the report page tooltip feature that we used on the maps in my report and creating these is simple. Part of the script Gartner provided was to build two or three visuals that had been used in the initial dashboard. We started here, and tried out the specific questions through Q&A. These were the results basically without any further tuning! All we did was name the columns in the data appropriately and tag the state field as being geographic data. You’ll also see that Q&A prompts you as you type with the fields and values that match your partial word. 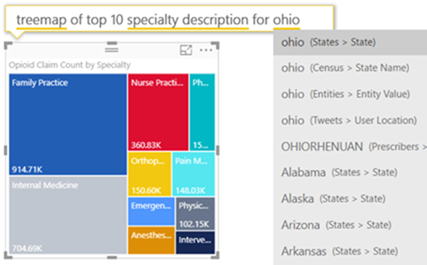 Ohio was identified as a state in several columns ([State], [State Name], [Entity Value], [User Location]) and as a partial match to the Prescriber name. For demo purposes we left the Q&A model there, but we could have improved it by adding synonyms, normalizing some of the repeated state fields, etc. The selected shapes, textboxes and callouts correspond to a particular bookmark. They only showed up as outliers when cross-filtering on Purdue’s data, so we stored that as a bookmark too, and used the Selection pane to control the visibility of the textbox and lines for the last bookmark. We wanted to include some real time data in the demo and pulling tweets in to a dashboard is an easy way to monitor this for any keywords. On the pane that appears choose API and click Next. 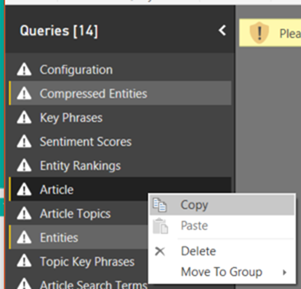 Make sure you enable the Historic Data Analysis option too, so that a Power BI dataset is created for your data to be stored in. 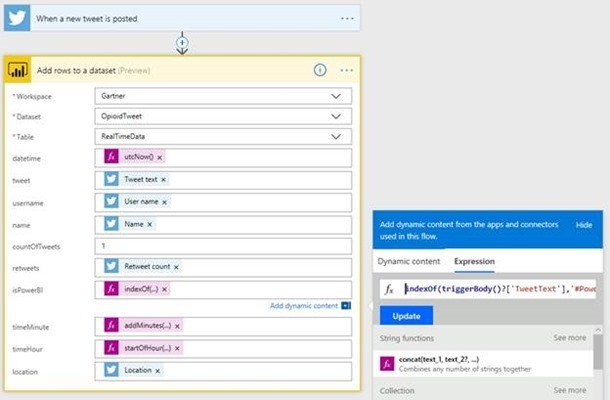 We used some custom expressions for some fields to see if the tweet included the #PowerBI hashtag, and to extract certain parts of the time. 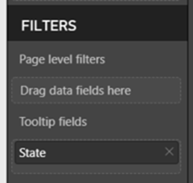 Save your flow and you should see tweets start to flow through to Power BI. You can then use all the normal report creation tools to build visuals and pin them to your dashboard. to use in a visual that always displayed the most recent tweet. You can interact with the report and download the .pbix file from the Data Stories Gallery here! Let us know if you find any other interesting insights in the comments below.